Heather has just returned from Monaco after setting a new 48hr road running record of 315km equates to 196miles of non stop running. the race called no finish line, is such a unique race in the World it allows both everyday people and athletes to attain and achieve personal goals. 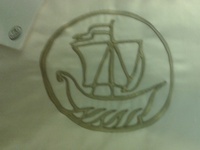 heather ran on behalf of the patron saint of Monaco Saint Devota "the spirit of devotion which suited her well. "Crewing for herself cooking eating n sleeping in the port cabin heather excelled running 380miles in 4 days and setting a new GB 48hr record, with a diet of white wine smoked salmon, mash potato garlic n ginger, chocolate brownies tot of brandy chocolate bars apple juice n hot chocolate from the vending machine at night heather was rewarded with a nights stay at the 5 star metropole hotel in montecarlo a well deserved rest to which she was really grateful"
I now snow shoe ! Whist running as Heather in the European 100km in Belves France April 2013, I sustained severe bruising n nearly fractured my Tibia..
from 2005- 2012 n for phil Hampton at the Dartmoor Discovery who BELIEVED IN ME ! 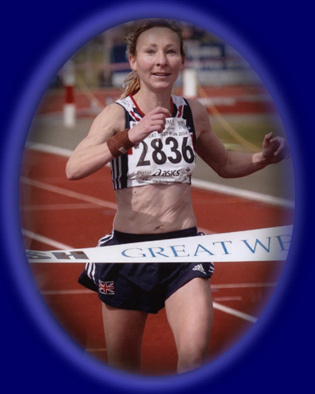 has aided Heather in the recovery and continued rehabilition of her right leg stress fracture in 2007.
won the Great Btitish 100km Campionships in Galway Ireland March 2009. 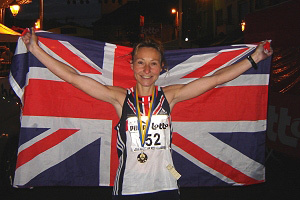 Heather is representing Great Britian in the World and European 100km Championships being held in Belguim June 2009. 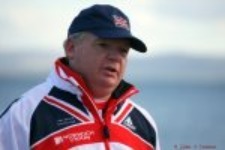 As a warm up Heather coasted around the Great West Half Marathon May 09 and final preperation race is the Edinburgh Marathon held on the final week of May. Heather has now adpoted the Power Plate motto "Believe you can" is very apt. We wish her well. Heather completes 100K world championships. The 23rd running of the IAU World and European 100km championships took place at the “Night of Flanders” race at Torhout, Belgium on 19th June. 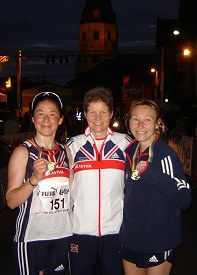 The UK team was led by Heather Foundling-Hawker (Honiton RC), the current English and UKA champion and a previous top ten finisher in this event. Accompanying Foundling-Hawker was Sandra Bowers (Winchester) making her international debut, writes team manager Carolyn Hunter-Rowe. The race, which attracted over 200 athletes from 28 countries, consisted of 5 loops around Torhout and the neighbouring village of Lichtervelde. Starting at 8pm an additional challenge is created by running through the night. Foundling-Hawker started well and by 60k was running inside the top 10. Despite tiring slightly over the last third of the race Foundling-Hawker hung on well to finish in a gutsy 8:36:20, a very creditable 16th place overall and a top 10 finish in Europe. This is her last 100k before hopefully competing for England in the Commonwealth championships in Keswick. Bowers, after a promising start, struggled with severe stomach problems in the early part of the race. To her credit she hung in and started to recover in the second half, finishing strongly in 8:58:13, good enough for 24th place. On a very humid night, the race winners were Japan's Yasukazu Miyasoto in 6 hours 40 mins 44 secs (men's race) and Kami Semick of the USA (7.37.24) in the women's race.